Home / News / SS4: Allen Out, Henry Leads, McGarrity Up To Third, Feeney Lucky! Philip Allen has stopped at the start of stage four. He was complaining of a fuel pressure issues at the end of stage three and it appears his rally is over. Desi Henry continues to lead the rally with Callum Devine in second position. Henry’s lead has now been edged out to around 17 seconds. He reckoned there was a mix up in the stage times at the end of stage four but hopefully organisers will have any issues rectified soon. 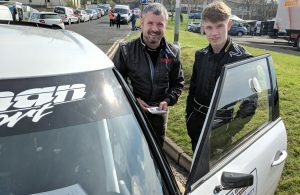 With Allen seemingly out of the rally, Callum Devine’s second position should be a little more comfortable ahead of top two-wheel drive crew Ryan Loughran in third overall. Alan Carmichael was unhappy at the stage finish has a fuel pump issue which is causing a misfire. Hopefully he can get his car fixed in service. Crews are now heading back to service before tackling the final two stages of the event. Desi Henry leads the rally by 17.9 seconds from Callum Devine while Derek McGarrity is starting to get on the pace. He climbed to third overall with third fastest time through stage three. Derek McGeehan didn’t have any issues through the second loop of stages and his earlier paddle-change troubles have disappeared. He says his son, Mark, is doing a great job reading the notes too and it’s showing in the crew’s stage times. 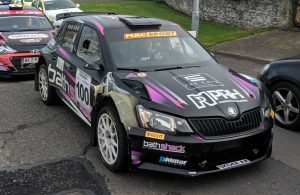 Martin Cairns lost time with another spin during the second loop as he continues to acclimatise to rallying on tarmac. 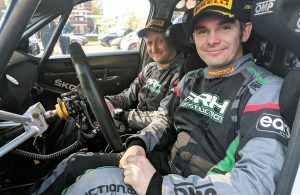 Camillus Bradley reckons he was given a wrong time for stage four and Kevin Eves arrived back here with a little bit of cosmetic damage to his Corolla after clipping a bank. 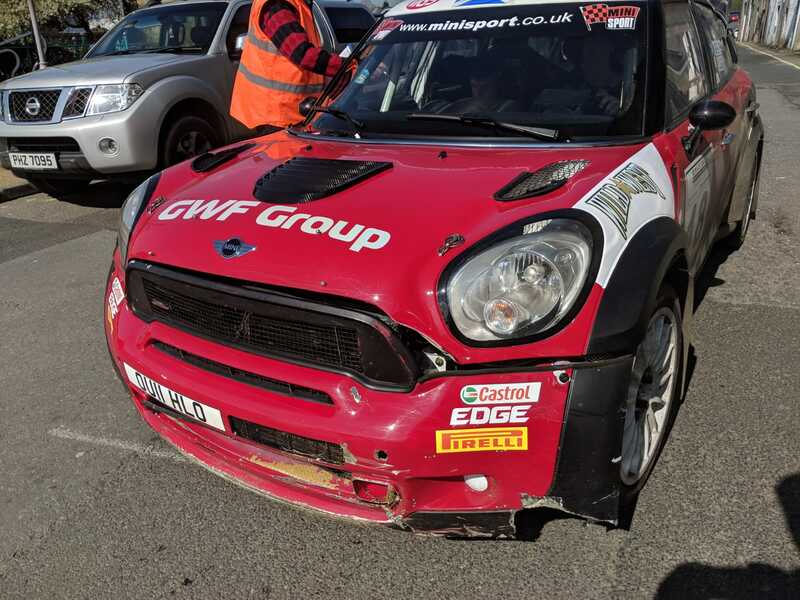 Also sporting some damage was the Mini WRC belonging to Nigel Feeney and Conor Duffy. In fact, they’re lucky to still be in the rally after their stage four incident. Stanley Ballantine revealed he finished painting his car two days ago and only had his rear window bonded in yesterday morning before arriving at scrutiny in his Evo X. As for Aaron McLaughlin, it’s only his second time competing with a left-hand drive car. In fact, the first time he was in a left-hand drive he “smashed it” so he’s happy to still be in the rally! Crews are now in service. Just two stages remain before the Eakin Bros Brian James Trailers Stages rally winners will be crowned! Live stage end reports are available from fb.com/onthepacenote and results are available from www.rallyscore.net.